You are well beyond the point of knowing that your independent hotel needs to be on social media. You’ve laid the solid ground work, based on a social media strategy, for answering customer questions and helping them share their memorable experiences with friends and family. And you’ve seen results in increased organic social media engagement, occupancy rates and revenue. Now what? Planning and executing a hotel social media campaign is a great way to level up your results. A solid strategy and engaging, everyday tactics deliver day-in-day-out returns. With a special campaign and a little extra budget your independent hotel can see follower rates multiply instead of just incrementally increase. Deeply engaged followers are set up to become guests and (maybe more importantly) brand ambassadors. Increased revenue and the engaged following are the obvious “why” for a hotel social media campaign, so how about the “what”? What are some social media marketing ideas that can actually turn the dial for your hotel? It’s difficult to give a one-size-fits-all answer — individuality is what makes a boutique hotel attractive — but contests are typically the best place to start. Usually, this means asking users to generate content (photos, videos or stories) that relates directly to your hotel’s brand and experience in exchange for the chance to win a prize. Influencer campaigns are a special subset of these where hotels strike agreements with social media users with large, engaged, and relevant followings to create content for a more direct, explicit incentive. Hotel social media campaigns can also take a more traditional advertising form and tell followers about your hotel’s benefits and features. Equally, a campaign could give followers a deeper, more textured look at a special event you’ve planned — a concert series or an art installation. Regardless of their content, there are four key elements (the “how”) for successful hotel social media campaigns that I’d like to cover in detail. At a certain point, every independent hotelier comes to realize that they can’t personally make every bed, greet every guest, or plate every meal. Part of the boutique, independent advantage is that you and your core team can do some of these things, some of the time. By focusing on what you do best and what your guests value most, it is possible to find special moments to make the experience of staying at your property more personal and human for your guests. Plus, Snapchat, Whatsapp, LinkedIn, Youtube, and several others have worthwhile, if sometimes niche, applications. That’s a fair question — you should meet the customer where they’re comfortable — but it also fails to recognize how important it is to think of a hotel social media campaign as a special part of a broader strategy. An independent hotel should aim to build a vibrant community where guests can interact with you — and tell their friends about the great time they had. Here, “vibrant” really is shorthand for active and well-used. Spread too thinly, say with a couple dozen contest entries on each of four separate networks, a campaign looks dull and underused compared to one that concentrates all of the activity in one place. The announcement post on Facebook for the Palomar Hotel’s holiday social media campaign. 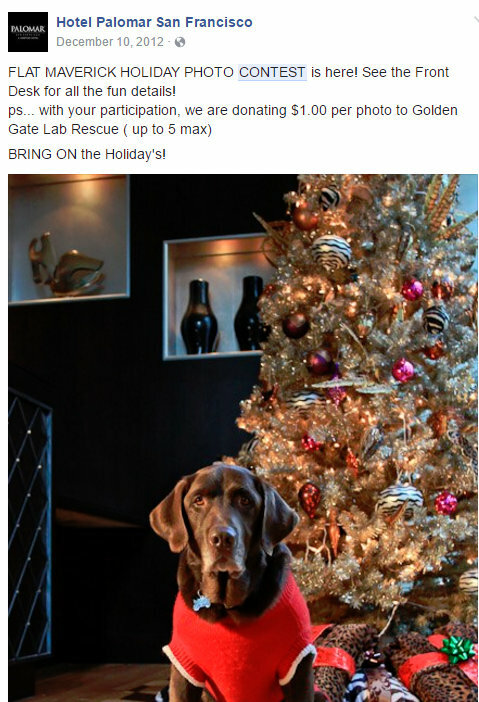 For their quirky (but engaging) Flat Maverick photo contest San Francisco’s Hotel Palomar (now known as Hotel Zelos) asked guests to pose around the property with a cardboard cut-out of Maverick the chocolate labrador retriever. Then they concentrated the entries on their Facebook page. Facebook draws some of the best elements from the first two and adds the potential for community discussion and cultural connections. 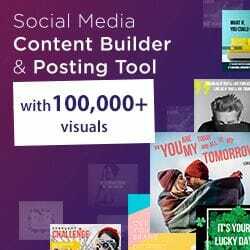 Facebook also has the most robust set of tools for designing a paid social media campaign. If your campaign seems like it would be a perfect fit on all three, there is a very good chance you need to start over. Curate, prune, and be specific. Focused hotel social media campaigns have a proven track record of generating extra revenue. By running a well-designed Facebook campaign, Starwood Hotels had tracked an additional US$2-million in room sales. Your independent hotel should probably have two or three focus networks and your social media campaigns should, almost always, focus on one. Social media shouldn’t live in a bubble divorced from your guests’ real-life experiences at your property. Campaigns should connect as closely as possible to the physical (and emotional) experience guests have when they stay with you. Sol Wave House in Mallorca has an ongoing campaign designed to deeply integrate the guest experience with social media. A key element of their program is inviting guests to use a hashtag to do everything from ordering a taxi to having a sandwich delivered to their poolside lounge. Are you hungry? Make your #poolbarorder tweeting us with your location and we’ll bring it to you. Guests at the Sol Wave in Mallorca can complete several regular tasks using a hashtag. When social media first insinuated itself into all parts of our lives, we started to recognize standard “shareable moments.” And plenty of them happened while on vacation. It was nice that customers felt automatic triggers for sharing. Easy and comfortable. But the best hotel social media campaigns give guests a subtle nudge to see that social media time is all the time. Vacation memories are individual and shouldn’t follow a preset pattern. Hotels can also base their social media campaigns around specially-designed, physical features. The Dream Hotel in New York City has a wall-sized art installation made from beer cans, arranged to look like an American flag. A photo taken by a Dream Hotel guest in front of the Beer Wall. It’s the definition of a made-for-Instagram space. “Made-for-Instagram” already feels like a cliche, but there is real value to be gained from recognizing the blurred lines between our lives when our smartphone is being held at arm’s length for a perfect selfie and when it’s in our pocket. Do companies still give away iPads as prizes for the contests they run as social media campaigns? Don’t be that guy. Contests can be a great opportunity to gather a list of potential customers and sort them across two dimensions: people who are interested in your product and willing to engage with your brand beyond just a transaction. If someone has taken the time to create an entry for a photo or video contest, they are well on the way to becoming advocates for your independent hotel. A popular gadget or generous cash prize might attract a large crowd of entries and make it feel like your campaign has been a success but these are people who have indicated they are interested in another company’s product. For all you know, they might have little or no affinity for your brand. The obvious solution is to offer free stays as a prize for contest winners. The on-brand prize for a social media campaign run by the Drake Hotel. Even better: Sweeten the deal by adding products from complementary brands to the room stay. 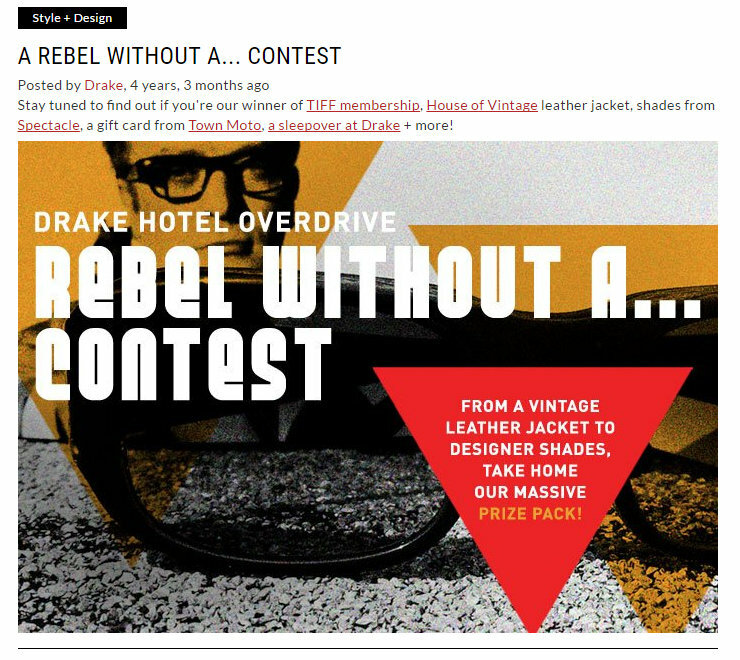 For one of their contests, Toronto’s award-winning Drake Hotel threw in everything from a House of Vintage leather jacket to a membership for Toronto’s world-renowned film festival. In other words, campaigns should double-down on the strengths and niches that make your hotel special to guests who stay with you. Work with friends and leave the generic gadget prizes to faceless corporations. When the Fairmont Pacific Rim executed a contest that connected their wedding and proposal services to user-submitted love story videos, they saw a measurable increase in leads worth US$760,000 in potential new business. a band that has performed at your hotel. What pillars and values drive your general traditional and digital marketing activities? What makes your brand memorable? Staying as close as possible to these is probably the primary key for a successful hotel social media campaign. A campaign absolutely can be special and focus on an out-of-the-ordinary offering (like a series of guest chef dinners) or a one-time event (a special photography exhibition, for instance) but your social content and scope should feel natural and in tune with the rest of your hotel’s marketing activities. In 2012, Langham Place created a series of short films to highlight the luxury experiences they offer. All three videos in the original campaign were shot on an iPhone, to reflect the brand’s youthful and urban clientele but, at the same time, had a polished and professional look that is in line with the cultured refinement they want to portray. To connect with potential customers in China, Asian luxury hotel brand Shangri-La ran a 360° Shangri-La campaign on Weibo. The contest encouraged followers to share photos of new Shangri-La properties in exchange for the chance to win a stay at one of their properties. The key here is that the name of the campaign connected to each hotel being listed in degrees of longitude from the original in Singapore and that reflected the brand’s global, world-spanning ethos. Connecting authentically to the values you share with your guests is the key difference for independent hotels. The campaigns we build for your boutique hotel will have a distinct start and end date. They’ll also set specific goals and we’ll know, going in, how we’re going to measure success. We’ll also give them a hashtag so that users can follow the campaign’s progression and so they understand that this is an extraordinary activity. 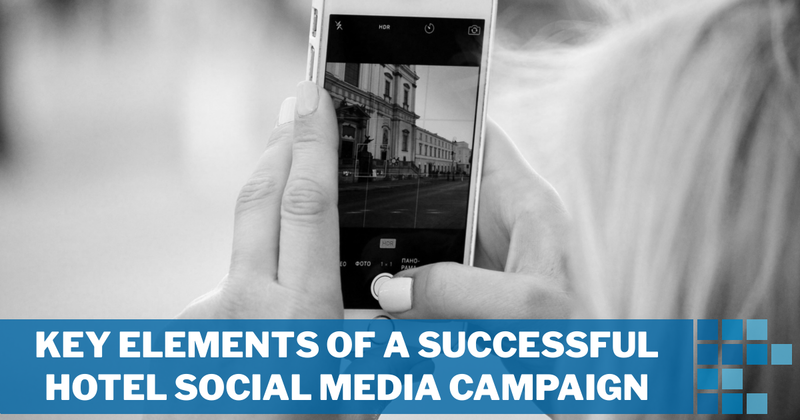 These are the nuts and bolts of social media campaigns in general. or be built around a special in-person event. and highlights the values that make your hotel memorable. Drop us a line to start a conversation around how we can plan a home run social media campaign for your hotel.